We are manufacturing Pool Thermometer which give a temperature reading from several inches below the surface, instead of just at the surface, where the water is typically warmer. It is ideal for monitoring the temperature of swimming pools, spa baths and ponds. Swimming Pool Thermometer: Hanging and Floating. Check the water temperature with one of our quality thermometers that have easy to read displays in both Celsius and Fahrenheit and come with a string for securing to a ladder or handrail. 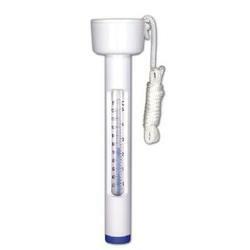 Pool Thermometer are designed to fill with water so that they sink below the water line, whereas the floating thermometer is designed to float at the water line.